The weather conditions at the AT&T Pebble Beach Pro Am have been far from ideal, and on Sunday, the tournament was delayed once again. After rain forced the second round on Friday to be suspended, Sunday's concluding round started late and was eventually delayed due to pebble-sized hail pellets. With the greens covered, play was halted at 10:53am local time in California. 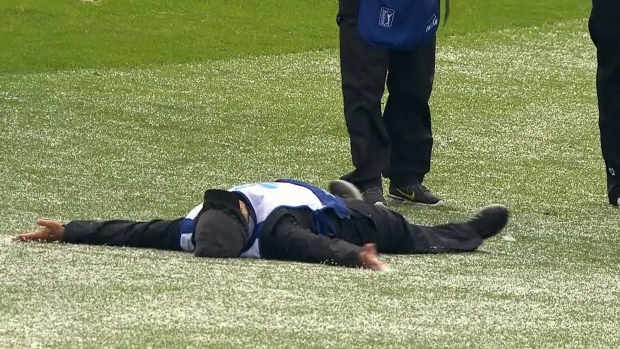 To pass time during the hail storm, some golfers and caddies decided to have a little fun out on the course by making hail angels and chuck balls of hail at each other. At the time of the delay, Paul Casey carried a three-shot lead over Phil Mickelson. Squeegees and leaf blowers were used to clean up the greens, as the grounds crew worked to make the greens playable. What a beautiful day to enjoy the scenery of Pebble Beach, California!